The TV series Shaun the Sheep is from the award winning Aardman studio, creators of Wallace and Gromit. The book series coincides with the movie’s pending release. At the beginning of the book is a double page map of Mossy Bottom Farm in great detail, followed by a brief bio and image of all the sheep characters, the farmer, Bitzer his dog, and Shaun the sheep, leader of a flock with human-like intelligence. Bitzer is always ready to help Shaun get the mischievous sheep out of trouble, (although they always have a good time). The farmer of Mossy Bottom Farm is oblivious to all the shenanigans that go on around him. That leaves the fun-loving sheep to take advantage of his ignorance. Mossy Bottom Talent Quest is open to everyone. The farmer is choosing which jacket to wear and is honing his skill of blowing balloon animals through his ears. 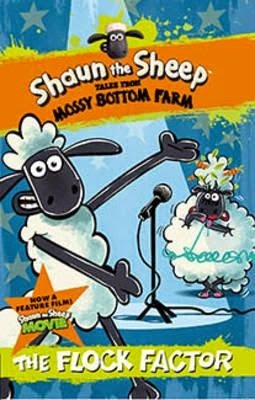 Shaun decides that the animals of the farm should have their own talent quest. Sheep verses chickens. Images of fame and the benefits that it will bring start forming in the sheep’s minds. Timmy’s mum proves to have a hidden talent that surpasses all expectations. But she also has extreme stage fright. Shaun must discover a way to make her get up on stage, and defeat the constantly ridiculing chickens. Can he do it? Lots of things go wrong but there are also many surprise outcomes. The book carries a strong underlying message of having a go at things, for this can show that you are better than what you imagined. The text is sharp and clever, and extremely funny. It produces strong visual images equal to the TV show. It has fantastic illustrations with half of them in comic strip form. The six pages of activities at the end relate to the story. This series is a winner and kids in the 6+ age group (and many adults) will love it! It’s ideal for reluctant readers.